Albert Avdolyan, 45, an ethnic Armenian and Russian citizen originally based in Moscow, bought Maltese/EU citizenship in 2015 for himself, his wife Elena Avdolian, his sons Albert and Gaspar Avdolyan, and his daughters Alexandra and Elvira Avdolian. Their names are on the list of people who acquired Maltese citizenship by whatever means (including naturalisation and marriage) published in the Malta Government Gazette on 2 August. They are not immediately identifiable as a family group because, apart from the fact that Identity Malta has listed all the names in alphabetical order by first name rather than surname, the male members of the family are Avdolyan while the female members are Avdolian. Avdolyan, who is chairman of Expatel, lives in Beverly Hills, California, in a mansion estate he and his wife Elena bought from Lisa Vanderpump, star of Real Housewives of Beverley Hills, in 2011 for $19 million. After the mansion accidentally-on-purpose caught fire during renovations, it was torn down completely and the Avdolyans built a massive French-chateau-style mansion instead. The mansion estate is now worth $30 million and in 2014 was transferred to a family trust, the Aga Trust. The Avdolyans will, of course (I don’t think) be relocating from their $30 million Beverly Hills estate to a flat at Blue Harbour in Ta’ Xbiex or one at Tigne Point – or perhaps they will save money by renting a maisonette in a Naxxar side-street, like that Chinese aluminium billionaire who bought a Maltese passport. That year, Albert Avdolyan was one of six ethnic Armenians on Forbes’ list of 200 richest Russians. He ranked 133rd with a fortune of $750 million. 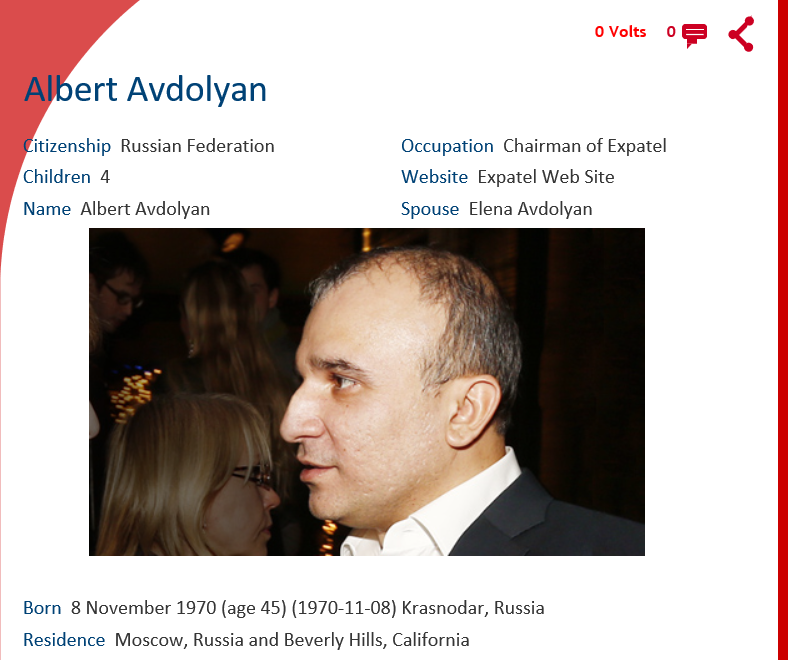 Albert Avdolyan also owns another Beverly Hills estate which he bought in 2009 for $13 million, and where he and his family lived while their other Beverly Hills mansion was under construction. A New York journalist had asked me for my views about the sale-of-citizenship scheme back in 2013 when it was world headlines, and was taken aback because I said that the second worst thing about it (the first is that it is being sold at all) is that it is being sold so cheaply. She thought €650,000 is the most enormous sum, and was staggered when I said that it is actually peanuts – more so when you consider that children and spouses and in-laws pay a fraction of that, around €50,000. To those who buy a home for €300,000, €650,000 for EU citizenship is unaffordable and the most enormous sum. But that’s not the market – and to people with fortunes of several hundred million dollars, who buy homes for $19 million, knock them down, and build something even grander, €650,000 is risible chickenfeed. The Maltese government and Henley & Partners got the price all wrong: they could have sold fewer passports for much, much more money. But then perhaps they had a reason for keeping it that low. In any case, it’s fundamentally wrong to sell citizenship, for two cents or two million euros.